As promised, I am back to let you know what we have been doing for the last few weeks. Other than having lots of fun with all the nice friends we've made here, we have been busy closing the boat up for the season. I have to give credit where credit is due - Bruce has done 90% of these jobs because I have been avoiding any heavy liting for now. And he has done a wonderful job of it! It's a lot of work. First, Bruce removed and stowed the canvas bimini and secured the metal supports so they can withstand Florida's summer storms (or worse). Second, he snapped on the canvas helm cover. Then, any loose items that were outside were brought inside for safety. That included all our teak folding chairs, our new woven vinyl deck chairs on the flybridge, any extra lines, extra fenders, boat hooks, really.... anything. Next, we both wiggled around and under to secure the canvas dinghy cover. Perfectly balanced I might add :-) Our technique has definitey improved. All our lines were doubled up and re-balanced so that we lie away enough from every rub-able surface even in a very strong wind or storm. It's kind of a reach to get off and on but it is well worth that. A few extra fenders were hung at strategic points, all of which had been recently firmed up with extra air. See how far away we are? That is with a very strong port side wind pulling all our port lines tightly. We wrapped our shore power cord at a couple of places so it can't wiggle loose. Last, but not least, we emptied and cleaned out the refrigerator so that the compressor wouldn't run all the time and heat up the inside too much. The dehumidifier heats the ambient air enough by itself. Here Bruce secured the freezer and fridge doors together, and we placed one of our deck chairs in front to keep it firmly standing open. Here we sit in sunny FL, it's a beautiful 88 degree day. It's actually really hot with no wind today. We are sad to see our season coming to an end. We are sad to be saying goodbye to our new friends. Yet, we look forward to getting back to our "other life" up north were we also anjoy a very happy life at the beach. So, my friends, I wave goodbye for now. I will return in the fall when we are back to the "boating life". May you all enjoy a fine and healthy summer season. And may all you boaters enjoy calm seas and lots of current at your sterns so you fly like the wind! So, here we are at pretty much the end of our cruising season. We will stay here for a few weeks to slowly close things up and get ready for the summer in the cooler north. I hope to seek the relief of chiropractic care for my ailing spinal issues until I can get a more thorough evaluation from the specialists at home. I haven't mentioned it much, it sounds so pathetic... but Bruce, too, has been struggling with a real problem with his knee. He twisted it a while back and it barks at him many times every day. We are quite the pair! The blind leading the blind. Here our girl sits in her slip, happy and restful. I originally thought I would wind things down here, but we have been enjoying our time in Vero in the last couple of weeks so I though I'd tell you about one of our adventures on land. 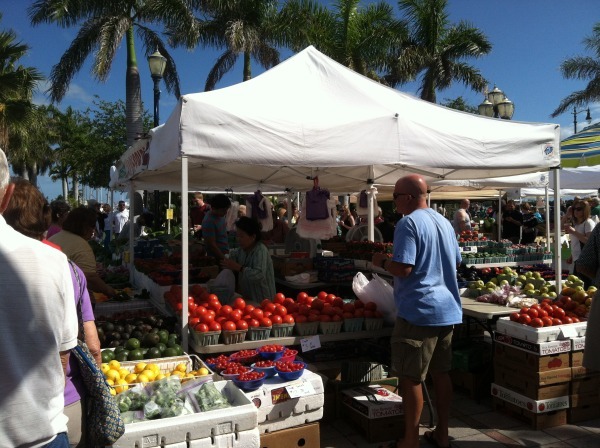 Yesterday, we had planned to trek off to Fort Pierce on our occasional Saturday morning jaunt to the weekly farmers market. It's a terrific farmers market, so we go when we can. But, someone told us that an "Oyster Festival" was going on in Fort Pierce today as well. So, which to attend? no way could I walk both but....we haven't ever been to an oyster festival before so we enthusiastically decided.... Oysters you say? We're there! It was great. It was a bright, warm breezy day. The Fort Pierce waterfront is lovely. So we sat and enjoyed that for a while. and somewhere, I think, "flavored" (whatever that is) but we are oyster "purists" so we went the traditional raw route. BOY! Were they good! After meeting lots of nice people, wandering around booths, enjoying very entertaining people-watching, and, of course, thoroughly filling our oyster-loving selves we waddled back to the car and then to the boat and relaxed for the evening. It was a good day had by all. I'll be back soon to chat up what we are doing to close things up for the season. Ah, the journey to familiar territory was very comfortable. A few bridges were passed under. The waterway through here is entertaining and beautiful. We saw this young lady enjoying some quiet morning calm water. We approached super super slow and she really appreciated it. And lots of shallow areas (off channel) to cringe at as well. And peaceful serene moments to exerience. At the end of the day, we pulled into Four Fish Marina in Jensen Beach. First thing Monday morning the boat is to be pulled on to the hard for a bottom paint and changing the zincs. Here we stayed for a couple of days. Once the work was done, we were off to our current "home" - Vero Beach for a little rest time before we have to go home to the still frozen north.